New research from RED C has found that the population is approaching 2017 happier than for some years, but with some significant concerns for the year ahead. In a recent study completed by RED C as part of a worldwide survey conducted by WIN/Gallup International, over 3 in 5 of all adults state that they are happy, a further increase on the upward trends in happiness seen last year, while just 12% suggest they are unhappy – the lowest levels recorded since we began tracking happiness among the population in 2011. 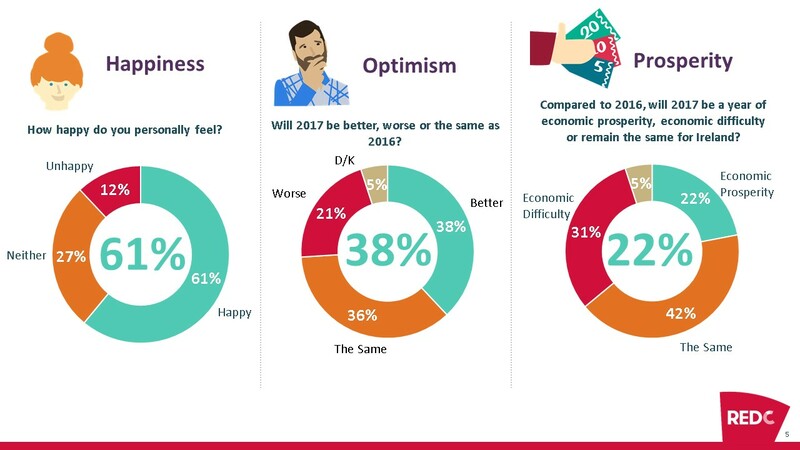 However optimism for the year ahead has fallen, with just over a third (38%) suggesting 2017 will be better than this year, while 21% suggest they think 2017 will be worse. The two stand out features of the year ahead, that being Trumps inauguration and the UK’s Brexit plans, certainly appear to be providing some concern for people in the year ahead. There is also for the first time in five years, a significant rise in those who believe that 2017 will be a year of economic difficulty. Almost a third (31%) of all adults suggest they believe 2017 will be a year of economic difficulty, compared to just 19% who felt the same way approaching 2016. This is a reversal of a trend since 2011 that has up to this year, which had previously seen year on year people believe the year ahead would be more prosperous than the year before. 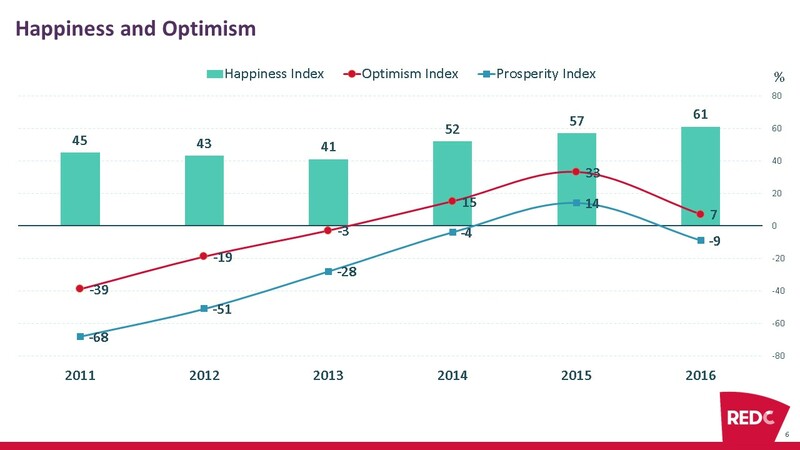 When it comes to economic outlook across the rest of the world, the study shows that 42% of the world is optimistic for the economic outlook in 2017, almost double (22%) of those who are pessimistic. Net optimism (the percentage of those saying next year will be one of economic prosperity minus the percentage who say next year will be one of economic difficulty) has fallen from +23% to +20%. European citizens are significantly less optimistic than anywhere else in the world: EU Europe net score of -26%, an average that is significantly worse than seen in Ireland at -9%. The challenges posed to the very future of the EU project in 2016 may well have created economic doubt within the world’s largest economic bloc. Within Europe, economic pessimism is most acutely felt in Italy (net score of -48%), the UK (net score of -38%) and France (net score of -35%). The WIN/Gallup International survey is an annual tradition initiated by and designed under the chairmanship of Dr. George Gallup in 1977. It is conducted every year since then. This year it was carried out by the WIN/Gallup International Association in 66 countries around the world. It is the poll’s 40th anniversary. A total of 66541 people were interviewed globally. In each country a representative sample of around 1000 men and women was interviewed either face to face (25 countries; n=29211), via telephone (13 countries; n=10754), online (25 countries; n=23947) or through mixed methods (3 countries; n=2629). The field work was conducted during October-December 2016. The margin of error for the survey is between +/-3-5% at 95% confidence level. In Ireland, RED C interviewed a representative sample of 1000 adults online throughout Ireland between 27th – 30th November 2016.